These features and benefits make Harrison Assessments an ideal resource for career assessment from the individual, organizational and institutional perspectives. The feedback session is important to understanding the implications of the person’s strengths and how they fit with the individual’s career aspirations, background, and experience. 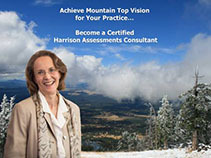 Whether applied for individual career decisions, or career center counseling, or for organizational hiring, Harrison Assessments is a powerful resource for sound career decisions.